* Translated from Spanish, it means Black Shadow. The spelling is one letter off from Sombra Negra, who are vigilante death squads who fight criminals and gangs. * Shadow is definitely an accurate term as the fragrance from top to base is clouded by smoke. The initial top note is almost overwhelmingly smoky. The smoke slightly recedes to a very dry patchouli. * The title is also slang for “cast your shadow,” or a call to someone to climb on top (with sexual overtones). * The smoke clears a little bit more and some more spice comes out with clove and pepper tempered by a small taste of the sweetness of iris and orange. * While the top notes are strong and project, once they recede the scent wears much closer to the skin. * The base notes of cumin and pepper last a really long time and are quite warming, though the smoke persists. It’s kind of like of when you leave a smoky night club and your clothes still smell of it, but in this instance it’s a light, faint smoke that is a pleasant memory. Summary: Sombre Negra can easily be a signature fragrance for someone who likes things dark and have a unique take on life. Whereas most fragrances start with pepper, this one ends with these notes. Once the top notes recede, the fragrance is quite warm and comforting; almost like a protective shadow. 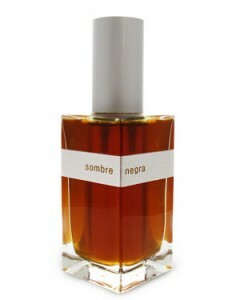 Yosh Sombre Negra is available at Luckyscent and Barneys New York. I really like how you give us some linguistic background on perfumes. This perfume is stunning and an excellent value. With so many niche perfumes houses popping up these days, it’s a relief to find one that doesn’t charge an arm and a leg and still smells of quality. I need to try this one. Sounds like something I would like.